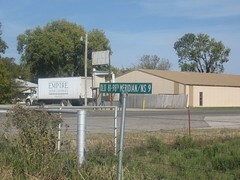 This is the only county seat on the 98th Meridian in Oklahoma. 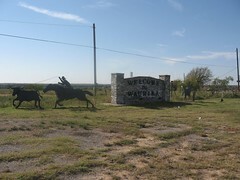 Townsite, on west side of line, was in Kiowa-Comanche Reservation opened to settlement on Aug. 6, 1901. 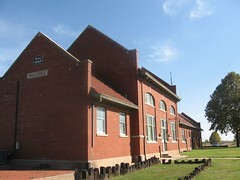 Moneka was the post office, established 1895, on east side of line, in Pickens Co., Chickasaw Nation. 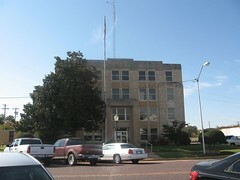 Waurika post office opened June 28, 1902. 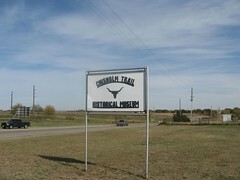 * One U.S. Highway 70, west of the railroad in parkway about two blocks off Main Street in Waurika, Oklahoma. * location unverified. Description from "Mark of Heritage" by Muriel H. Wright (1976).